Casa da Levada is located in the Aboboreira mountains, approximately 15 kilometers from Amarante, with wonderful views over the Tamega valley. These mountains divide the Douro River valley from that of the River Tamega. Although the location is high and scenic, a short car journey brings you down into the town of Amarante with its much acclaimed golf course and other tourist attractions. Travanca de Monte, the village in which it is situated has small streets, just wide enough for a cow cart, that twist and wind through the village and around the big granite boulders and quaint water mills. 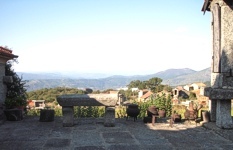 Enchantment is added by the ancient 'espigueiros' which are used to dry the corn. 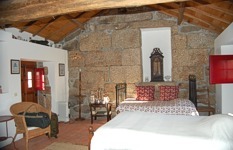 The house itself forms one side of the village threshing floor with two of the other sides being 'espigueiros'. The name Casa da Levada translates as the manor house of the 'Levada' or granite water course for the transport of water. The fresh mountain air is a tonic in itself which can be heightened by a brisk walk up the 900 m high mountain nearby. Granite water reservoirs are used to supply the surrounding corn fields and to provide a water flow for the water mills. Their deep cool natural spring waters make an ideal place to have a swim. The house has one double and four twin bedrooms, one of which has an en-suite bathroom. A second bedroom has a bathroom under the floor which is reached by a trap door in the floor. The third bedroom has a private bathroom just outside the room. 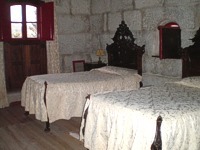 One of the bedrooms is in the original 15th century fortified tower. closing the heavy wooden doors. There are many verandas round the house suitable for sitting with a good book and a bottle of wine. Alternatively guests can use the lounge in the house. 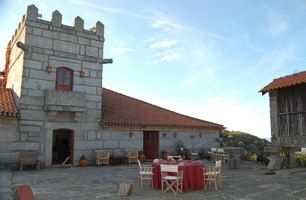 The owner delights in the guests joining him for an evening meal where he will tell you of the times when the great Portuguese poets such as Teixeira de Pascoaes, Raul Brandao, Antonio Carneiro, Mario Brandao and others used to come to this paradise in the mountains. We discovered a very pleasant place in Casa da Levada. No noise, mountains all around and everyone was very hospitable. The rooms are very clean. 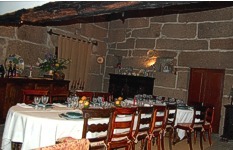 Casa da Lavada is well placed between Porto and the Douro's valley. We specially appreciate diner with the owners and their hospitality.